In July 1969 a young American GI-barely 21 years old and enticed into the military just a year prior by his dream of flying-finds himself on a plane bound for South Vietnam and the 101st Airborne Division as a CH-47 Chinook helicopter pilot. Dale Petersen uses descriptive prose and excerpts from letters to give the reader an intensely personal view of that life-shaping experience over 37 years ago. 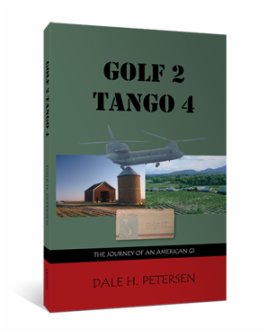 Golf 2 Tango 4 takes readers back in time to what it felt like to be 21, homesick and unsure of what lay ahead...but willing to reach down inside for the courage to find out.